Celebrating its 21st birthday, this year the European Kit & Sports Car Show will boast some of the finest hand built and replica super cars in the UK, as well as brand new features such as live music, camping and drag car demonstrations. The very best of ‘ready to drive’ and ‘part built kits’, Super Car body kits, Race and sprint cars-all from the top manufacturers. Come along to Kent County Showground, Detling near Maidstone on Saturday 21st and Sunday 22nd May for a great family day out! Keep the kids amused with quad bike rides and the funfair, while checking out some of the most beautiful kit cars around. If that isn’t enough, the ample free parking and great food will only help make for one of the best family days in Kent this May. For enthusiasts, there will be over 30 manufacturers, 60 trade stands and 30 kit car clubs to inspire you, alongside more than 400 privately owned kit cars. Some of the country’s finest manufacturers are expected to be showcasing their enviable creations in the main glass-walled exhibition hall, including Great British Sportscars, GKD Sportscars, Hawk Cars and Road Runner Sportscars. Other top manufacturers due to attend include Gardner Douglas, Sebring, Fury Kitcars, DJ Sportscars as well as a large display of Hot Rods from the Invicta Roadsters Club and British Hot Rod Association. This year’s show will also launch three new cars; a mystery car from the Dutch company Faroux Sports Cars; the Spyder from Sammio; and Buggie kings- ATV 4x4 buggies with the Route. In 1896, the Englishman Thomas Hyler White developed a design for a car that could be assembled at home and technical designs were published in a magazine called The English Mechanic. This is thought to be one of the first Kit Cars made. Head down to the European Kit & Sports Car Showat the KentCounty Showground, Detlingthis May and give your family a day out they will never forget! 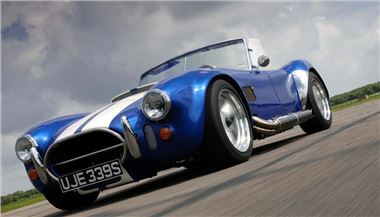 The European Kit & Sports Car Show 2011 takes place at The Kent County Showground, Detling near Maidstone, (ME14 3JF - junction 7 M20) on Saturday 21st and Sunday 22nd May from 10am – 5pm both days. Adults £11, children 12 years and under £2. Kit Car Drivers with their cars enter free!